Not sure whether I like this or not to be honest. I don't think I've got my layers right. Still, it's pretty enough. All done with die cuts. It's pretty, I like the colour combo. Lovely colours & very different. How big is it Lorraine? Got another one in the kit, so I'll probably do that in 'more my style'. 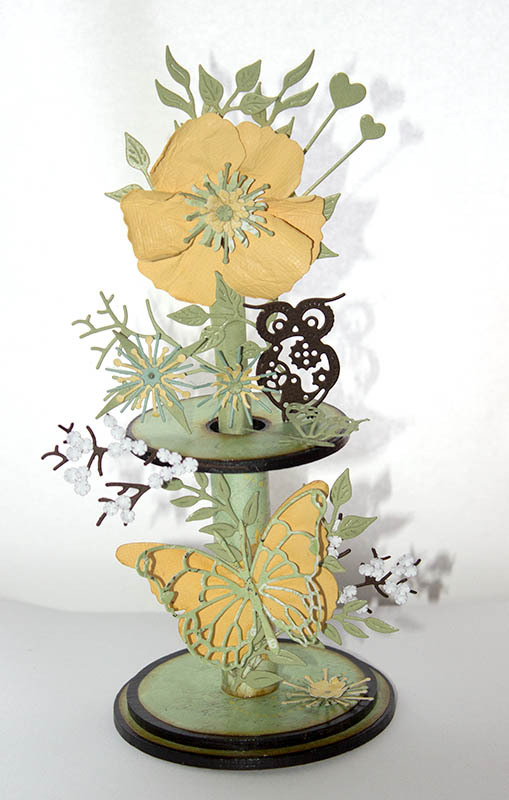 It's super work, maybe it's the proportions of the butterfly and flower being so similar, or it needs a bud or something, 2's often don't balance. It is good though, but when you say you'll make one that's more you I can't wait to see it. Or does the centre of the flower need a bit more depth of colour, Hmm, still very likeable. The proportions and the 2 it is! That's it. I keep looking at this: your work is beautiful, as always Lorraine, but I'm not sure what the purpose of the spool and the rest of the base and spindle are - they seem to get in the way, if you know what I mean. You've got me, Lynda. I don't know either lol. I think it was just another craft company money maker. Still, I have seen some nice ones.